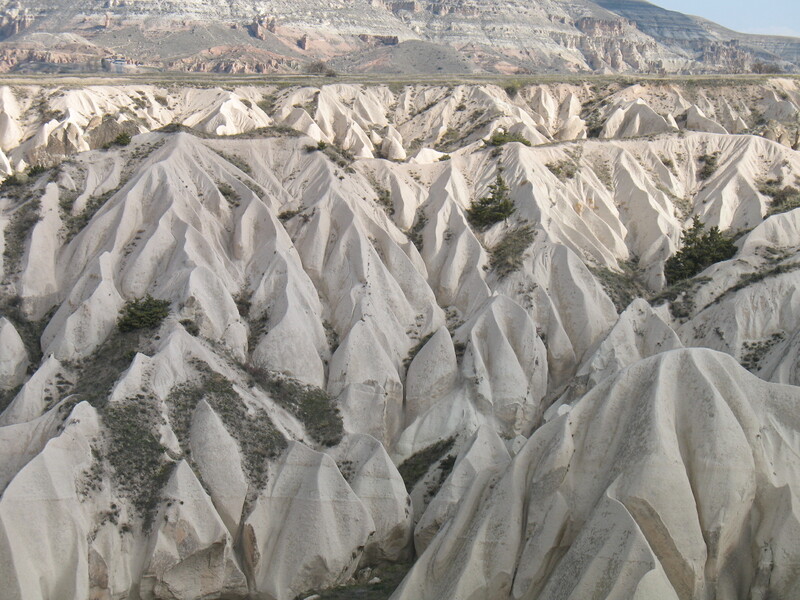 Cappadocia immediately reminded me of the South Dakota Badlands, but other comparisons are Flintstones’ Bedrock City or Luke Skywalker’s Tatooine. It is an other worldly place that seems more out of fiction than reality, but then you realize these strange-looking rock formations have actually been used as homes and churches for centuries. Although I had two different guides (who both spoke good English and have university degrees in tour guiding) explain it to me and and I read the explanation in Lonely Planet, I still can’t describe exactly how the “fairy chimneys,” pillars of soft sandstone, are formed with the caps of harder stone at the top that seem to defy gravity as they balance on precariously thin columns. Stranger still is that up until a couple of decades ago, these fairy chimneys and the surrounding cliffs were used as homes for either people or pigeons (where people “mined” the pigeon manure for fertilizer) for millenia. Millenia…that’s thousands of years. That’s hard for me to relate to since I can barely remember what I had for dinner yesterday. 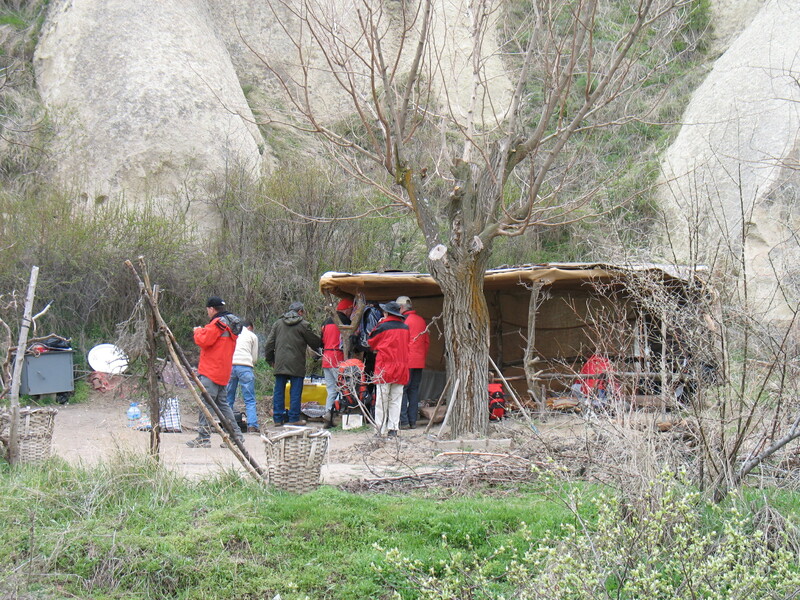 And although the people have been forced to move out (the Turkish government declared living in the eroding fairy chimneys as unsafe…imagine that), they still tend their fields amidst the geologic formations, oblivious to the tourists tromping around and taking photos. And you realize how close all these little towns are (or how powerful the loudspeakers are on the local minarets) when the Muslim call to prayer drifts through the valleys of cliffs and rock formations. Somehow the prayer call is much more melodic and magical drifting through those peaceful valleys than it is right overhead at 5 a.m. when you’re sleeping. 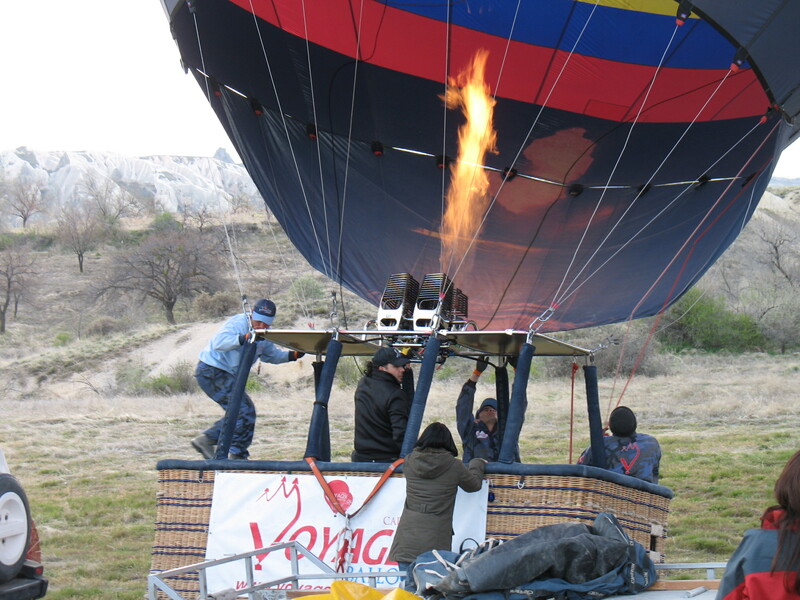 Another great way to see the geologic formations of the area is by hot air balloon, where you drift around the formations, back a nd forth, up and down, as the winds and the occasional blasts of hot air take you. I was amazed at the skill of our pilot who was able to guide us (at least somewhat) simply by watching other balloons and which air layers were moving which direction. “Hold on to the person next to you,” the pilot suggested. “Going through the landing together results in many marriages!” Since I was sharing a balloon basket with three women from Spain, that was an unlikely outcome for me. In any case, we landed with barely a bump, even though the balloon next to us landed in a tree. It was only after we were out of the balloon and they’d fed us cherry juice mimosas that our pilot told us stories of bad landings and a polyester balloon that ripped mid-air. Hmm, bring on a little more champagne. This area was also an area of refuge for Christians escaping persecution, first from the Romans in the 1st and 2nd centuries, then from the Arabian armies in the 6th century. The Christians built homes and churches in both the fairy chimneys and by digging out caves and tunnels underground. There are literally thousands of churches – many of which could only hold a few people. But they were ornamented with frescoes that were as elaborate as though hundreds of people worshiped there. Only a few of the frescoes are still undamaged. Our tour guide told us that years ago, when local parents were exasperated with their children, they’d tell them to “go play in a cave.” The children’s favorite game was “kill the invaders” and so they hacked away at the frescoes, especially the faces, with sticks and rocks. What playful children didn’t destroy, time and erosion added to, and now most of these cave churches have only faint traces of paint remaining. In only a few churches (especially the Dark Church in the Goreme Open Air Museum), are the frescoes well preserved. The underground city almost did me in. I know I have a touch of claustrophobia (even in the middle seat on an airplane). Although I’ve toured caves before and never been bothered, hunching over to waddle through the tunnels with my back scraping the ceiling of the tunnel made me want to start throwing myself against the walls and screaming. Especially because I knew there was no way out except to continue forward. Deep breaths, I kept telling myself, just take deep breaths. I have never been so glad to see an overcast sky as I was when I emerged from that tunnel. If I’d been a Christian in the 6th century, I would gladly have taken my chance with the Arabian armies who wanted to kill me rather than crawl into that hole and live by creeping through those tunnels. Of course, a nice thing about Cappadocia is that it’s easy to shake off the buried-alive feeling of the underground city…or sore muscles from hiking…or brain overload by absorbing centuries of history and geologic education by ending the day with a visit to a hamam (Turkish bath) or sipping some local wines. A couple days in Cappadocia became a relaxing vacation within a vacation. 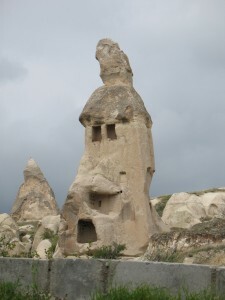 Cappadocia sounds like an extremely interesting place. . . so much history, so many pigeons. I would definitely like the hot air balloon ride better than exploring the caves. I have enjoyed your entries so far. FYI, I finished your editing, and thought the booklet was very well done. Enjoy the rest of your journey. Thanks Jennie! And I can see I’ll have my work ready for me when I get back! 🙂 Thanks for doing the editing…. Carolyn — We have geologic formations like this in New Mexico, just north of Albuquerque. They are at an area called Tent Rocks because they look like tall, narrow teepees. They are made of volcanic tuff with a “cap rock” on the top is all that is left of a harder volcanic layer that used to cover the whole area. No one ever lived in the Tent Rocks here. 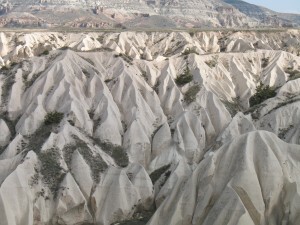 Cappadocia is one of the areas that I hope to see some day. It is so cool that you were able to fly over them in a balloon. Vince – oh wow, I had no idea we had anything like this in the U.S.! I guess I have to get myself to New Mexico! The balloon ride was definitely worth it….